Marie Winn's Central Park Nature News: LEO in park!!! It's always exciting news to hear of an owl sighting in Central Park. 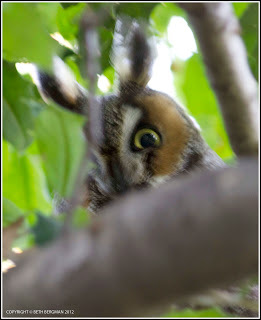 Two days ago, on 10/17, a little after 3pm, Beth Bergmann [http://thebethlenz.blogspot.com] saw a Long-eared Owl in an unidentified part of Central Park - people are rightly careful about giving exact locations for these vulnerable birds. She got a few quick photos to prove it. Congratulations are in order. Pale Male's Kids are back in the park!